We were quite intrigued when we received this lovely editorial from a team of talented West Coast wedding pros. What made it unique was that they came up with a romantic scenario for their couple and designed around their story! They wondered…what if a couple met while on holiday in Mexico and then married here on a beach…how would it look? 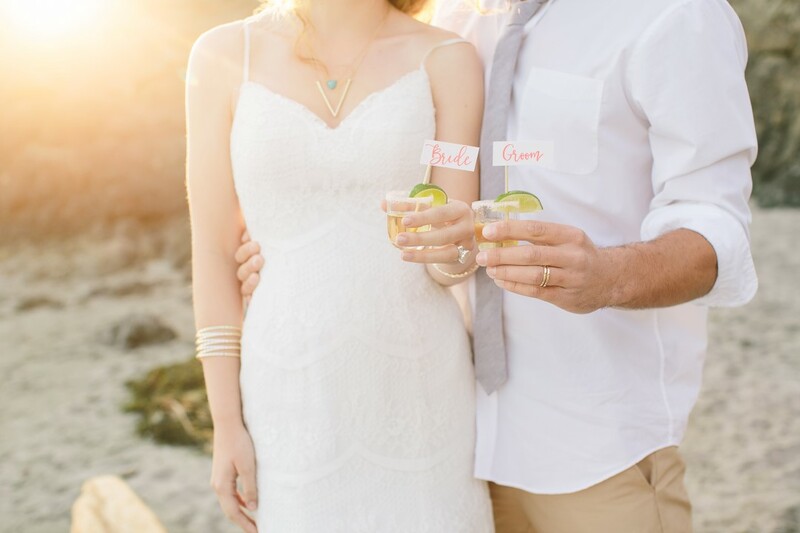 We get to enjoy their beach wedding inspiration with this dreamy, romantic Mexican look filled with bright florals, unique jewelry and fun details. We have to give special notice to our groom who is dressed relaxed and casual – perfectly matched to the bride’s beach worthy gown and braided hair. Our fav thing in this editorial, we admit, are the florals. Tea roses of every hue brighten the neutral beach colours and draw attention to the beautiful ‘table for two’. The paper suite is impressive with beautiful artistry and style variations. Last, but not least, the tequila and limes are perfection!